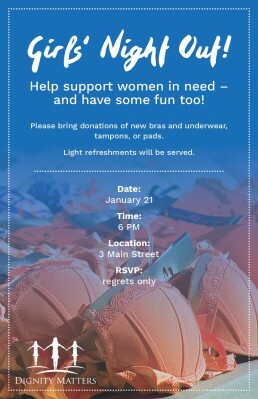 Hosting your own event to collect feminine hygiene products (tampons and pads) and undergarments (bras and underpants) for women in need is a great way to help Dignity Matters! You can host a cocktail or birthday party, a high tea, or even a holiday themed party for the cause. You will have fun, show real leadership, and support women experiencing hardship at the same time! 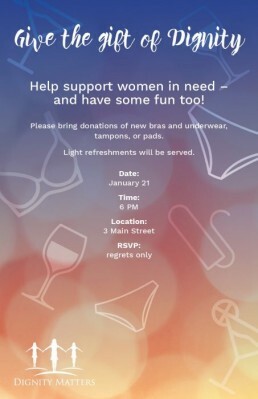 Who can host a party for a cause? 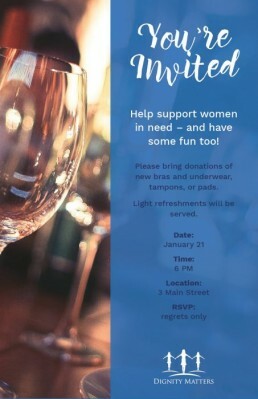 If you would like to host an event on behalf of Dignity Matters, simply complete the short form below, and we will be back in touch fast to provide you with information, a fun event invitation (please see below), and some tips how to make your party a success! Don’t delay…….. register you party below today, and choose your party invitation!